Gold import control - Does it work? The Govt. thinks that gold imports cause high Current Account Deficit (CAD), and therefore, gold imports should be curbed. As outright ban on gold imports would create uproar, Govt tried doing it in a roundabout way, with mixed results. RBI came out with this circular in August 2013. The circular says that any importer of Gold has to keep 20% of such imported gold reserved for exports. In effect, the gold importer has to supply this gold to an exporter,who would in turn export it out of the country. The 20% is to be kept in bonded warehouses with Customs till an exporter is found. The remaining 80% can be sold in domestic market. However, if the 20% kept with customs is not subsequently exported, the importer cannot import further. The RBI circular presents a worked example on this. Also, if only a part of that 20% is exported, the quota allowed for imports in the next lot shall decrease proportionately. The circular was supposed to decrease the import of gold. What it did, was to stop imports completely into the domestic market for some time. The field formation of customs department didn't know how to go about, given the language of the circular, and stopped all import gold consignments till CBEC came up with their own notification to supplement the RBI circular, in september. Here's the link. However,the language of the circular makes it amply clear that the Govt. doesn't want any imports of gold into domestic market. They have excluded the premier trading houses, nominated agencies, SEZs/EOUs from being counted as exporters. It has worked. The gold imports have come down drastically. The import of around 3.5 Billion USD since mid of this year of gold (compared to around 18 billion USD last year for the same period), is proof enough. Most of even this imported gold has gone for exports as it was imported against advance licenses for duty free clearances for exports. So, in effect, there is hardly any raw gold in domestic market at the time of this posting. Does that mean the jewellers are not making jewellery? No. They are getting smuggled gold which is commanding a premium of around 20% (10% duty saved + 10% smuggling costs). The premium is going up every day. Does the CAD look good. Yes. On paper it does. But is it sustainable? That's moot. Because it's hard to believe that people have stopped importing due to these circulars. I believe that smuggling is back. And the payment is happening through hawala. Ajay shah elaborates on CAD here. The small amount of gold imports for exports purposes is by premier trading houses such as Rajesh Exports Limited (in Bangalore). Such imports are happening through advance authorizations issued by DGFT. There's an RBI circular that covers it here. So, in short, gold import for domestic consumption through legal channel is out. Gold imports for exports through legal channel is allowed and is being used by some big names in the field. Gold smuggling is on. And we don't know how the payments are routed through hawala. Is it hitting remittances, or is it being done through exports/imports misinvoicing or through services misinvoicing, only time may tell. What I fail to understand is the rationale of such moves. Is the govt. serious when it thinks that a pseudo-ban would lead to drop in gold demand/consumption? With an open current account, isn't the govt joking when it thinks about curbing capital account issues arising out of gold smuggling? Are there any lessons learnt? I bet there would be, in future, if this continues for long. And it would be simple. Such nonsense doesn't work, anymore. Trivia: A recent flight from Dubai to Kozhikode had around 60 passengers carrying around 1 kg of gold each. As per the rules, a passenger returning from abroad after a continuous stay of more than 6 months can carry upto 1 kg of gold with them. Customs collected 10% duty from all these passengers. Upon interviewing passengers, it was found that someone from Dubai sponsored their tickets for this service. Free tickets for this carrier service. Not a bad deal! However, this import is not logged into the data capturing system of customs. I hear that more than a tonne of gold came this route last month. Customs reported multiple cases of gold smuggling recently, and if we add undetected cases, one has to be naive to believe that gold imports has stopped. Further updated blog on this topic here. The WTO's Bali ministerial finally concluded successfully with an agreement which would be called 'Bali Package'. The package is a watered down version of what started very ambitiously with Doha round of talks around twelve years ago. The talks went through extremely bad patches in 2003 and 2008 when it was almost declared dead. People had started talking about moving beyond WTO, and indeed, countries had started working out regional agreements. So, not much was looked forward to in the Bali ministerial, and I thought it would wash out with India's resistance on food security clause (link), but it survived. Cuba made some noise, along-with India, on different issue altogether, but all came on-board to agree on this mediocre agreement. Mediocre when compared to what started out at initial Doha rounds. I take the figures above with a pinch of salt. However, it would put pressure on developing countries to improve their processes and systems. The objectives are: to speed up customs procedures; make trade easier, faster and cheaper; provide clarity, efficiency and transparency; reduce bureaucracy and corruption, and use technological advances. It also has provisions on goods in transit, an issue particularly of interest to landlocked countries seeking to trade through ports in neighbouring countries. Part of the deal involves assistance for developing and least developed countries to update their infrastructure, train customs officials, or for any other cost associated with implementing the agreement. The above is ambitious. India would have to put in money and efforts. Initiatives such as e-BRC will be the way to go for procedural and documentation simplification. Ports, airports, customs stations need upgradation, as well as DGFT, inspection, testing and certifying agencies and so on. India managed to have it's way in the end. I had blogged about India's concern here. India held the talks to ransom till the demand of food security clause being extended indefinitely was agreed upon. You can read more here and here. It was a personal triumph for Mr Roberto Azevedo, the new Director General of WTO. He has the momentum now. If he can capitalize on it, he might prevent WTO from fading into irrelevance. However, my personal feeling is that the easy agreements are all over. Only thorny issues such as agriculture subsidies, food security, market access etc remain from Doha rounds. They are difficult to handle and reaching agreements on them is challenging. It has been in news for few days now. After a very long time, WTO members seemed to have reached a position to clinch a deal. The deal was a toned down version of original mandate from Doha rounds, but even then, it was a big deal because it was a multilateral deal after a very long time. The world has drifted over to regional arrangements in recent years due to failure of Doha rounds. The multilateral differences are too many and too wide to be bridged, or so it was thought. WTO, as a multilateral trade body, started facing questions about its future. Some started to write it off. However, WTO remains relevant, even in the era of proliferating regional agreements, despite what some pundits say, due to its role in trade facilitation, enforcement and dispute settlements. And now, with the new Director General in place, it appeared as if finally a multilateral deal is about to fructify. India has remained sincerely and constructively engaged in negotiations. The current text puts developing countries in disadvantageous position. Doha round had development mandate, including food security at its core. We agree that food security is non-negotiable. Hence the text that dilutes food security is non-acceptable to us. We believe we should agree first on trade facilitation and helping LDCs, which this text falls short on. India supports multi-lateralism and we should look to build beyond Bali and work on it. So the last sentence says that India is not looking to conclude anything in Bali, with the given text. I have been liberal in re-framing sentences from the speech, but I have tried to keep the core intact. What the speech does is simple. While it takes a rigid stand on food security, it says it is ready for constructive engagement, as it always has been. It rises above the issue at hand, and takes a big picture view on multilateral negotiation. The problem is, the train of such big picture agreements has gone. India has its own domestic compulsions to stick to its stand. So be it. But to expect others to keep engaged with the chimera of big-picture multilateral agreement is too much to ask. One must appreciate and respect India for standing up for its right (or what it felt right!). However, one must also understand that it pushes the already tottering multilateral framework over the irredeemable cliff. Would India gain from this stand or lose? That's a tough question to answer. The domestic politics had tied India's hand at this point. With the recent food security act coming into existence, India cannot afford to have stifling WTO rules that makes it hard to implement. To that extent, walking away from this deal helps it to avoid future penalties on this account. On the other hand, the recent trend and growth of regional trade agreements is taking the momentum away from WTO. Agreements such as Trans-pacific, and Trans-Atlantic deals, in which USA is now actively engaging its energies, would take the trading world away from WTO framework. Any late entrant into such gatherings, as and when they expand, would face penalties. By walking away from this deal, India has thrown away a lifeline given to multilateral framework. The losers, for sure, aren't the developed nations. The gainers, as of now, cannot be ascertained. Rejoinder on 7 Dec 2013: After multiple rounds of consultation between India, US and WTO, a revised draft acceding to India's demand on agriculture has been put out. The draft might be generally acceptable to all. I had blogged about the revolutionary trade facilitation measure 'electronic-Bank Realization Certificate' (e-BRC) here. E-BRC was just launched by Directorate General of Foreign Trade (DGFT) at that time. It has been more than a year now and it has revolutionzed the way the bank realizations are filed in India. 6) Successfully enable bilateral or multi-lateral international cooperation. e-BRC project enables banks to upload Foreign Exchange realisation information relating to merchandise goods exports on to the DGFT server under a secured protocol. So far 89 banks operating in India, including foreign banks and cooperative banks have uploaded more than 64 lakh e-BRCs on to the DGFT server. This initiative has reduced the cost of transaction for exporters by eliminating their interface with bank (for issuance of BRC purposes) and enhanced the productivity of banks and DGFT. At the state level, Commercial Tax Departments of Maharashtra, Delhi, Odisha, Andhra Pradesh and Chhattisgarh have signed MoU with DGFT for receiving e-BRC data for VAT refund purposes. Many other states are in the process of signing MOUs. e-BRC project is a success story involving multiple stake holders, each with a different technology platform. This project is a live example of power of Business Process Reengineering (BPR) to improve service delivery. Way to go. As I said in the earlier blog, BRCs are just one small step for the trade, but this measure of going electronic, is a big leap in terms of trade-facilitation. There was a disturbing news item in the Economic times yesterday. The heading read "Finance ministry takes exception to commerce ministry OK-ing trade pacts; to take over negotiation of all investment pacts". Finance Minister P Chidambaram had raised concerns at Thursday's Cabinet meeting over the pact's text, which had been decided without consulting his ministry, after which the proposal was deferred. The finance ministry, which is the administrative department for India's investment policy, was neither consulted by the commerce department during the talks nor were its views sought when the draft text of the pact was finalised. The above difference was noticed while the cabinet went through the text of Indo-Asean comprehensive economic partnership agreement concluded recently. If it was a lapse, it must be rectified and mechanism must be put in place so that such errors do no happen in future. If it was intentional, which I hope was not the case, the delinquent elements must be fixed. Also, finance ministry should refrain from trying to take over trade negotiations through back door. It should stick to giving its views/opinions. It doesn't have the institutional ability to operate in these areas, as of now. Ministry of textiles came up with an order that mandates compulsory usage of Jute as packing material for the year 2013-14, yesterday. The bright idea is to promote jute usage, in this year of jute, to help employment in Jute sector, and keep the struggling jute sector alive. It would also help jute farmers. The legal sanctity for this order comes from Jute packing material act of 1987, under which Govt is within its capacity to come up with such an order. The detailed order can be found here. Basically, it mandates that 90% of foodgrains, and 20% of sugar production must be packaged using jute products, mainly the jute gunny bags. The Jute bags cost around Rs 35 per 50 Kg bag, which translates into cost of packing sugar at Rs 0.7 per kg. On the other hand the cost of HDPE (High Density Poly Ethylene) bag is much less. The 50 Kg HDPE bag cost Rs 15 translating into per Kg cost of packing coming to Rs 0.30. Therefore there will be an additional burden of Rs 0.40 a kg for sugar producers. The cost benefit analysis cannot be just bare bones economics as above. 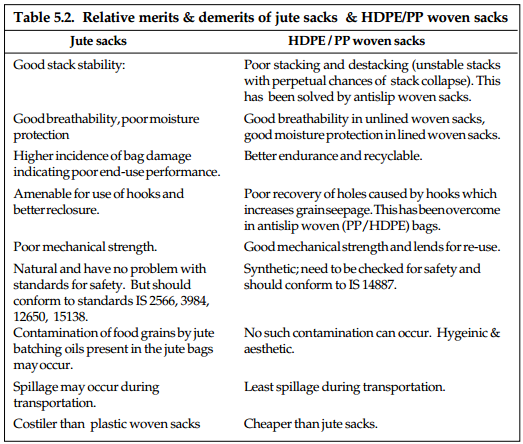 Jute is an issue that involves much more, in terms of livelihood issues. Around 3.7 lakh people are directly employed in jute industry and 40 lakh farming families depend on jute. The exports of jute, in terms of quantity has mostly stagnated for the last 15 years. Production and consumption of jute has also kept constant for the last 20 years. So, all such ideas that the Govt. implemented for the last 15-20 years, including compulsory measures for usage of jute packaging, seems to have failed. Someone needs to step in and touch the Jute issue in the larger perspective. Compulsory measures might help in short run, but in the long run, there has to be a sustainable solution. Also, a cost-benefit analysis of such orders needs to be studied in detail.